I saw this picture and find it both beautiful and compelling. I hope you love it as I do. In my research, I happened upon this tribute by D S Gill of the International Human Rights Organisation (IHRO) of which I am a member. It inspired me and I hope it inspires you! the spirit behind these documents and the Sikh litany Raj Karega Ga Khalsa. has to project only the Khalsa polity. of leadership. For some time, collective leadership may the best choice. There is something very beautiful to me seeing anyone tie their dastaar, especially someone I admire. waheguru ji da khalsa waheguru ji di fateh veere plz. Before you begin to do anything for Khalistan, you may want to explain to non-Punjabis what you are saying. 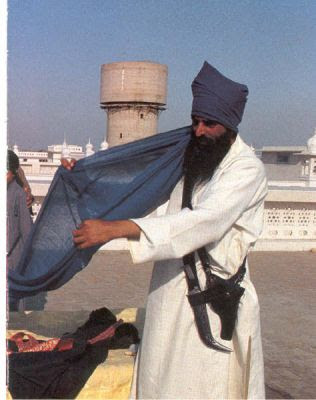 "brothers I'm ready for khalistan. whenever you ask for it my head is ready"
It is such a wonderful thought that everyone should be able to see and understand. The language of this blog , understrood by all its readers is English. If you want to be understood, it is necessary to use that language. How painful it is to know that an amritdhari sikh girl is being held by the haryana police, no wonder the people and haryana govt. is anti sikh, which they have demonstrated by attacking sikhs time and again. what is the fate of sikhs jailed/imprisoned since 1980's without any trial and offence. Is there an end to the atrocities on sikhs, if at all there is, its the complete freedom towards sovegnrity for the sikhs. We all eagerly work toward sovereignty and when it is Its Hukam, it will become a reality. Until then, we remain in chardi kala as we push forward.